October 2013 Archives - Clarksville Sports Network - Clarksville Tennessee's most trusted source for sports, including Austin Peay State University. Clarksville, TN – The Austin Peay football team will look to earn that elusive first win of the season under first year head coach Kirby Cannon on Saturday, as Jacksonville State comes to Governor’s Stadium for a 4:00pm kick-off. This the third of four homes this season for the Governors, who will play eight road contests this season. Clarksville, TN – Austin Peay State University’s volleyball team will attempt to climb back into second place in the Ohio Valley Conference when it hosts Belmont in a 6:00pm, Friday contest at the Dunn Center. 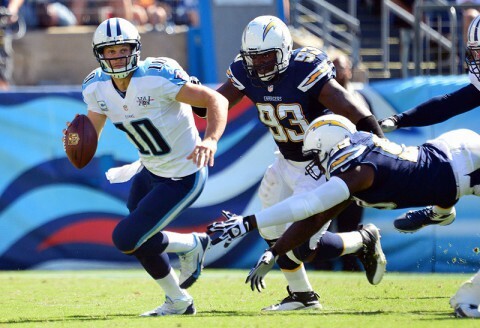 Nashville, TN – This week the Tennessee Titans (3-4) return from their bye with a trip to St. Louis to face the Rams (3-5). Kickoff at the Edward Jones Dome (capacity 66,000) is scheduled for noon CST on Sunday, November 3rd. This week’s game will be televised regionally on CBS, including Nashville affiliate WTVF NewsChannel 5. Marv Albert will handle play-by-play duties while Rich Gannon provides analysis. Ryder is 170 lbs and comes into his senior season with an 89-30 record. He has wrestled at Fort Campbell High School for 4 years. Fort Campbell High 170lb senior wrestler, Ki Ryder, (On left) has committed to join the Wheeling Jesuit University wrestling program. Nashville, TN – Senior Katie Proud (Knoxville, Tenn.) and junior Alison Alcott (Dallas, Texas) of the Belmont women’s soccer team were tabbed the adidas® OVC Offensive and Defensive Players of the Week, respectively, as announced by league office today. It marked the first time this season a Bruin had received either honor. Proud, a forward, scored Belmont’s equalizer goal on the road at Eastern Kentucky, forcing the game to be decided in overtime. BU went on to win the matchup 2-1 in the extra period. She also helped Belmont pick up its second shutout of the season with her unassisted goal in the 80th minute at Morehead State two days later. The Knoxville, Tenn., native currently leads Belmont in goals scored (4), shots on goal (17) and points (9). Clarksville, TN – Tala Mumford, Austin Peay State University’s senior golfer who tied for first at UAB Beach Blast with an even-par 144, has been named adidas® Ohio Valley Conference Female Golfer of the Week. Nashville, TN – Austin Peay State University head basketball coach Dave Loos was part of a seven-coach panel Tuesday that spoke at the annual Coaches vs. Cancer Tipoff luncheon, held at the Vanderbilt Student Life Center. Clarksville, TN – A return to its balanced offensive attack was the cure to end Austin Peay State University volleyball team’s two-match losing streak as it posted a three-set sweep (25-23, 25-16, 25-18) of Tennessee State, Tuesday night, in Ohio Valley Conference action at the Dunn Center. Gulf Shores, Ala – After smashing the program record for low round, Monday, Austin Peay State University women’s golf team tied the program’s former 18-hole mark, Tuesday, in the UAB Beach Blast, played at the Peninsula Golf and Racquet Club. Brentwood, TN – The Ohio Valley Conference has selected six individuals to receive its prestigious Scholar-Athlete Award for 2012-13. The award is the highest individual honor that can be earned by OVC student-athletes, and is given annually to three men and three women student-athletes of junior or senior status for their accomplishments in both the classroom and athletic arena, and because of their leadership qualities. The six winners were selected from a group of 22 finalists by a vote of OVC Faculty Athletics Representatives. Honorees must have performed athletically with distinction, earned at least a 3.25 grade point average and conducted themselves in a manner which has brought credit to the student-athlete, his or her institution, intercollegiate athletics and the OVC. The award is based on academic and athletic criteria/accomplishments achieved during the 2012-13 school year.